Blue Topaz is the traditional Birthstone for December. Its hardness, clarity, durability, beauty and affordability have made it very popular and many people use it in ornamental jewelries. It is highly recommended for people who are celebrating their 4th anniversary. It has a bluish color which is often confused with aquamarine. It is said that if exposed to sunlight for too long, it may lose its shine and color. 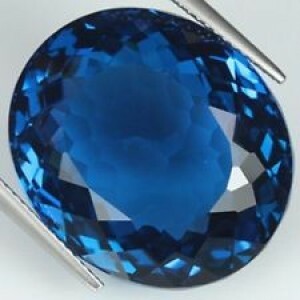 It is an extremely attractive gemstone. It is available commercially at very reasonable prices. So, many people all over the world use it as jewelry. A topaz stone is abundantly available and comes in a lot of color such as orange, red, maroon, gray, yellow, pink and many other colors but Blue topaz stone is considered to be the most famous one. What are the astrological benefits of Blue Topaz? • Blue Topaz helps in improving communication and self expression of people. So it is recommended for those who are weak in articulating their thoughts. • Blue is a very calming color and is also the color for throat chakra so people wear it around neck. • It helps in providing inner peace, mental stability and balances the Thyroid gland. • It has distinct energy for strengthening psychic gifts, so it helps in improving and amplifying the gifts that you already possess. • It has the ability to get tuned with the angels of truth and wisdom very easily. So, it helps during meditation to connect with your inner self. • It has excellent healing qualities for neck and throat area which helps in ailing many throat related problems. • It is said that they are very useful for travelers, businessmen, salesmen for protecting them from danger and homesickness. • It is useful in removing bad omens, calming anger and healing poor vision. • Its vibration helps in uniting body and mind with the soul. • It is a proven good stone for writers because it helps in expressing oneself in a better way. All these points clearly state that a Blue Topaz is a very useful gemstone. These are only a few astrological benefits that we have stated. In reality, there are about hundreds of more benefits of wearing a Blue Topaz. A gemstone doesn’t harm you in any way, but it is best to get recommendation from a learned person before wearing a gemstone, so that you can maximize the benefits that are already associated with that particular stone. Gemstone: Blue Topaz Ruling Heavenly Body: Jupiter Mohs’ Scale Hardness: 8 Specific Gravity: 3.4 – 3.6 Category: Topaz Crystal System: Orthorhombic Luster: Vitreous Transparency: Transparent Metal to wear in: Gold Origin: US state of Texas Blue Topaz is the traditional Birthstone for December. Its hardness, clarity, durability, beauty and affordability have made it very popular and many people use it in ornamental jewelries. It is highly recommended for people who are celebrating their 4th anniversary. It has a bluish color which is often confused with aquamarine. It is said that if exposed to sunlight for too long, it may lose its shine and color. It is an extremely attractive gemstone. It is available commercially at very reasonable prices. So, many people all over the world use it as jewelry. A topaz stone is abundantly available and comes in a lot of color such as orange, red, maroon, gray, yellow, pink and many other colors but Blue topaz stone is considered to be the most famous one. What are the astrological benefits of Blue Topaz? There are many astrological benefits of wearing a Blue Topaz. Some of the most famous ones are : • Blue Topaz helps in improving communication and self expression of people. So it is recommended for those who are weak in articulating their thoughts. • Blue is a very calming color and is also the color for throat chakra so people wear it around neck. • It helps in providing inner peace, mental stability and balances the Thyroid gland. • It has distinct energy for strengthening psychic gifts, so it helps in improving and amplifying the gifts that you already possess. • It has the ability to get tuned with the angels of truth and wisdom very easily. So, it helps during meditation to connect with your inner self. • It has excellent healing qualities for neck and throat area which helps in ailing many throat related problems. • It is said that they are very useful for travelers, businessmen, salesmen for protecting them from danger and homesickness. • It is useful in removing bad omens, calming anger and healing poor vision. • Its vibration helps in uniting body and mind with the soul. • It is a proven good stone for writers because it helps in expressing oneself in a better way. All these points clearly state that a Blue Topaz is a very useful gemstone. These are only a few astrological benefits that we have stated. In reality, there are about hundreds of more benefits of wearing a Blue Topaz. A gemstone doesn’t harm you in any way, but it is best to get recommendation from a learned person before wearing a gemstone, so that you can maximize the benefits that are already associated with that particular stone.